At dinner that evening, on 24th August, 2017, Juliet Blake and I sat down to talk. We skipped drinks, really who needs to drink when one is high on life ? We both were. She was seeing to fruition the labour of more than a year, in bringing TEDtalks to India. A belief that ideas worth spreading should have no barriers, they must spread across cultures, across languages and reach a larger, deeper audience. Because ideas spark more ideas and ideas spark change. A British lady, living in New York, overseeing a HINDI series in India. She had spent months in India and travelled for days on end in planes back and forth. Reading the scripts in English and connecting to every talk and speaker and, along with her team, giving us each encouragement to go out there and tell the world about our impactful ideas. Such a high to see it all come together with Shahrukh Khan playing host. Juliet told me she was certain she wanted only SRK to present the show. Then there was me. 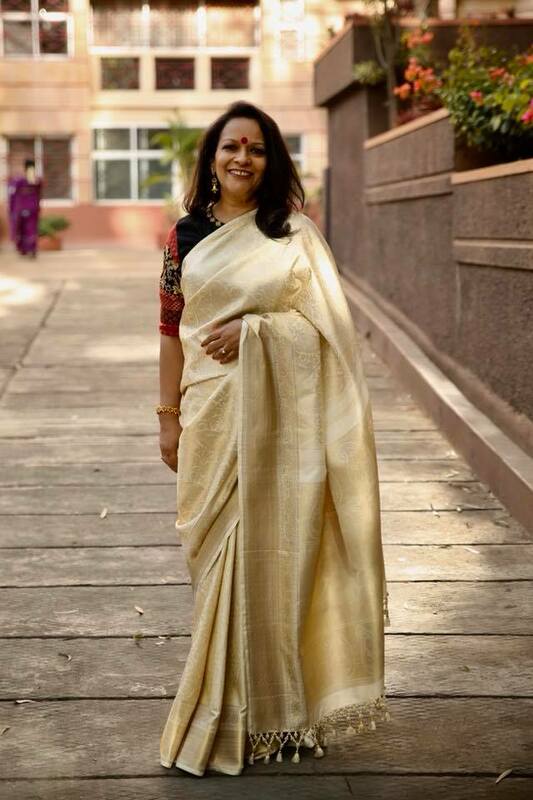 Freshly minted TED speaker, custodian of the#100sareepact stories, who had just told a few hundred in the audience and several cameras in the studio, the story of a movement that had become a platform for women to voice the stories of their lives. And receiver of a gift from Shahrukh Khan. I had actually been stopped mid step by other speakers several times at the studio, earlier that evening and told, “but he did not give us anything.” No clue what to say, I would smile or give them a big hug and move on. At the dinner table, Juliet asked, “What did he give you ? “. A beautiful Kanjeevaram, I said, describing it to her. Then she reiterated the same story that Sneha Baindoor had hurriedly told me on the sets as I was waiting my turn to take media shots with SRK on the red dot. The team, along with Juliet, had gone to his house to brief him about the episodes to be shot. Apparently he did not want to read our scripts and asked to be told a little about each speaker. It was his idea to sit in the audience, listen to each talk for the first time, and ask us impromptu questions after. When he heard about the #100sareepact, they tell me he got emotional. He asked the team if he could bring this lady a gift. Errrrm, yes you may, you are Shahrukh Khan, you can do what you like…is what I believe was the general sentiment at the meeting. Closer to the shoot, Sneha had asked his manager if the gifting idea was still on, and if it was, she would arrange for a saree for him to gift the #100sareepact lady. She was told it had been arranged and she did not have to do anything. So here I am, Shahrukh, wearing the saree you gave me, on the third anniversary of the #100sareepact. The saree is cream and gold, my favourite combination and has paisleys woven all over, my favourite motif. Such a lovely coincidence. It’s been six months since I got this gift from you and I have waited to wear it on the pact for this day. I confess I was tempted to wear it on Diwali, even on my 50th birthday, but that would not have been right. I saw that you meant it in your eyes. And so I honour you and the memory of your mother today, by narrating your story on the pact through the medium of this saree, as I begin the third year of wearing my sarees and telling the extraordinary stories of my very ordinary life. You had also said that when I wear this saree and talk about the TED experience, you hoped that people would realise how we were all connecting with each other through our stories. Today, each pacter across the world is connected to YOU because you chose to tell your saree story to us all on that stage. And to everyone reading this, If the TED experience has taught me one thing it is this – Believe. Because belief is the only strength you will ever need. Meet my Lateef Fatima Khan saree. Named after the mother of the son who stood on the red dot, at a TED show, and gave us a glimpse of his love for her. Shahrukh Khan, thank you for making the pact your own. I wear your gift with absolute happiness and pride. Ethereal is the word that comes to my mind to describe this saree you are wearing, you are looking absolutely gorgeous. Wanted to personally thank you and Ally for making THIS happen for all of us women. I am a relatively new’ joinee’, having posted my first story in february this year; I have read all your posts till now, and that in fact prompted to post one of my repeat saree post. I am a doctor and i wear sarees to work most of the days. Having done my undergraduate studies in Tamilnadu (Christian Medical College, Vellore), wearing saree comes as natural to me as breathing!! 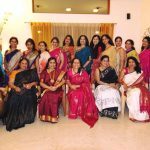 I have been wearing sarees for the last 30 years…..but it was not until i joined your pact that it became ‘delightful’ and an event that I look forward to every morning; besides realizing my writing potential. I did not know i had so many saree stories to tell. I’m not much in to social media, and people find it amusing that I am not on facebook. But this is something different, here one connects with oneself.